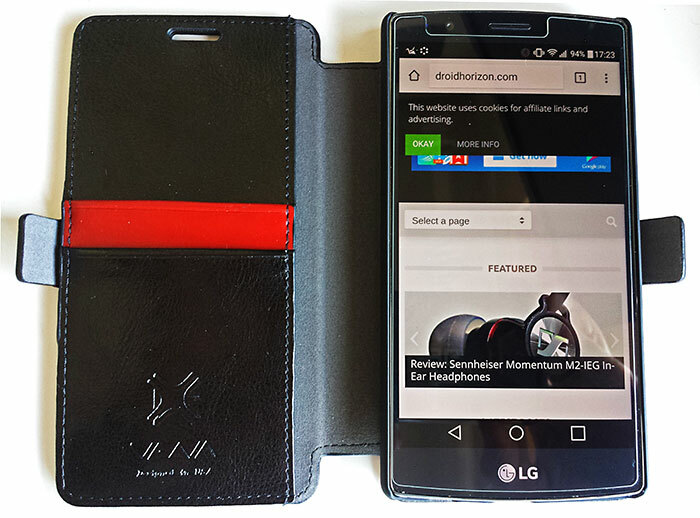 The Vena vFolio is a genuine leather wallet-style case for the LG G4 which has a fold-over front cover with pockets for a couple of credit cards and some notes. If you like leather but didn’t go for the leather backed G4 then this could be the case for you. 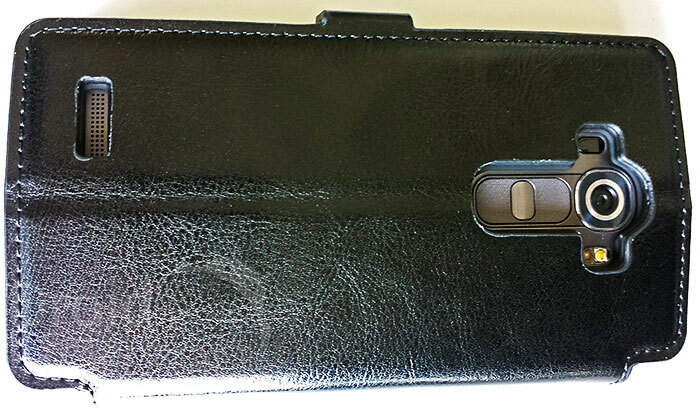 The case has a nice quality leather that is well stitched and I’d expect to be extremely durable. 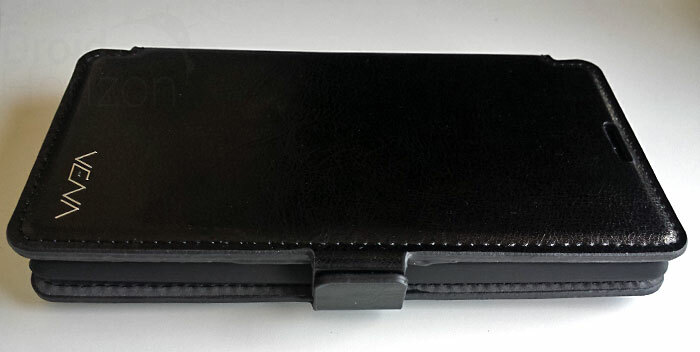 It’s available in a choice of colours (brown, grey or black) with a contrasting pocket colour and distinctive Vena logo that sets this case apart from the cheap pleather variety that can be found on eBay. 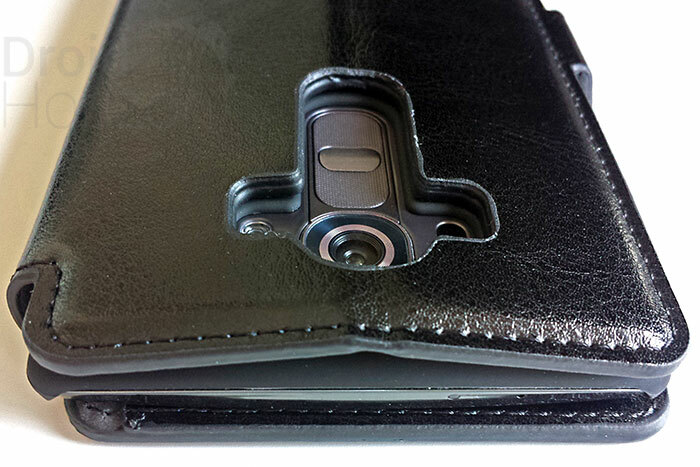 The G4 slips easily into the plastic bracket which holds it in place at the corners and along both sides. The top and bottom are left exposed for easy access to the ports, however as the leather extends out a little farther they should still be protected when the case is closed. There are two well positioned cut-outs – one on the back that leaves the camera and buttons accessible and another for the ear-piece in the front cover. I usually fold the front cover behind the phone during use which (as with most phones) blocks the camera but since the G4 has it’s buttons on the back they also get obstructed. This isn’t a huge deal thanks to being able to double-tap to wake and sleep, but is something to be aware of. The vFolio gets held closed by a couple of magnetic flaps that slide together. This does the job but the magnetic bond isn’t very strong and could easily open during a drop (especially with credit cards in place). If this happens the plastic brackets don’t extend very far beyond the screen and if you’re unlucky there is potential for damage. 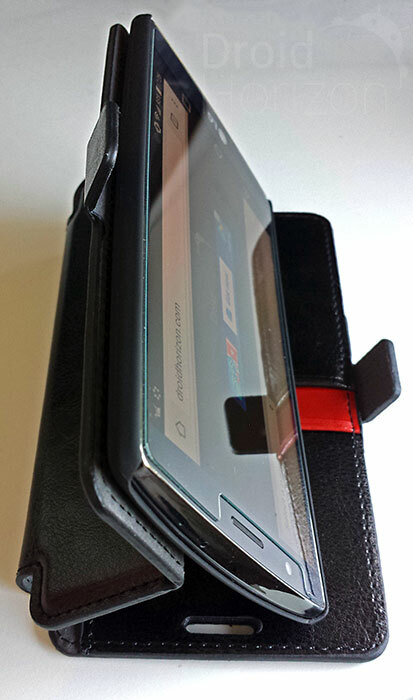 This case can also be folded into a stand that props up the G4 in the landscape position. 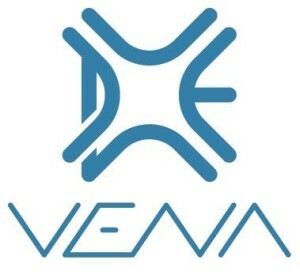 This works really well and is ideal if you enjoy watching video on your phone. The vFolio case is currently priced at £12.99 on Amazon UK and only $10.99 on Amazon US. Considering this is a genuine leather case this represents great value for money. Overall it’s a matter of taste whether the wallet style case will suit you as they do add a bit of bulk and the front cover can get in the way. If you can handle that then they offer great protection and you can even get away without carrying a separate wallet. With the vFolio, Vena have created a premium and stylish wallet case at a fantastic price which should give your LG G4 great protection throughout it’s lifetime.